The in basket: Scot Harper writes, “I have a fire zone striping question and one about street lights. “ We live in the new housing development off of Anderson Hill Road (near Gorst). In the last couple of weeks a red painted curb appeared on the new section of road in the development. This was expected as the streets are narrow and all the existing streets have a fire zone on one side. “What was surprising was the side of street it was painted on. The new section of street loops and connects two sections of Maritime Drive. So the side the new fire zone is on makes no sense for several reasons. – The inside only has three houses on the street on the south end and a park on the north side. “So who decides what side of street the fire lane is on, and who can we talk to about changing it? The out basket: Bremerton Fire Marshall Mike Six says he made the call on the striping. “I directed the contractors where to place the fire lane. Placement of fire lanes, which are required in this case, is at the sole direction of the fire marshal. The decision was based on firefighting tactics and the direction the fire crews would be arriving from. Derek Skanes of the city added that the fire lane requirement is a section of the International Building Code adopted by the City of Bremerton. “The real issue may be the scarcity of on-street parking and elimination of potential parking in narrow lots with front yard driveways,” he added. In the meantime, the city is working with Puget Sound Energy to get a light mounted on one of the three utility poles near the intersection. The in basket: Road Warrior readers have nominated two more intersections for the flashing yellow left-turn arrows that Kitsap County has deployed in many places. 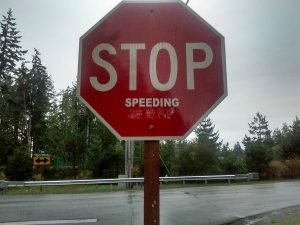 Bob Hoag says, “I think the blinking yellow left turn signals are great especially on Bucklin Hill Road in Silverdale. However, it seems the county forgot one location. With the new Greaves Way connection to Waaga Way, and the significant increase in traffic on eastbound Anderson Hill Road, left turns onto Old Frontier Road (which feeds into Greaves Way) are piling up. As a result, I was very surprised that the county didn’t add a blinking left-turn signal at the intersection on Anderson Hill Road and Old Frontier Road. Warren Nadeau feels the same way about the signal on Highway 3 between Bremerton National Airport and the Olympic View Industrial Area. “Cars trying to make a left turn into the airport or a left turn into the industrial area must sit with high speed traffic passing them for some time before the light changes,” Warren said. “Many times there are large gaps in traffic that would allow left turns to be made without stopping high speed traffic on the highway. It seems that it would be much safer and more efficient than having left turn traffic interfering with the highway traffic. “To anyone trying to make a left turn for one or two minutes while at a dead stop, with full speed traffic passing within inches in both directions (head on and from behind), it is downright frightening. You have no momentum to avoid a collision should someone move into your lane from behind or head on,” he said. The out basket: There is no immediate hope for a yellow flasher at either location. The airport signal is owned by the state, which has a policy that once a signal has been found to require one level of traffic control (such as a red arrow left-turn signal) it won’t go to a lesser degree of control without a significant improvement in the alignment of the intersection. That would prohibit either a yellow flashing left turn signal at the Highway 3 signal or that technology’s predecessor, a sign allowing left turns against a solid green ball light after yielding to all conflicting traffic. The in basket: Jessica Howell and a man who wants to go by just “Nick” want to know what to expect in the way of repairs on Anderson Hill Road in South Kitsap, on or near which they both live. Nick said some drivers are pulling into the oncoming lane when no cars are coming so they don’t have to use the downhill lane, where all the damage is. The out basket: I expected dirt or gravel when I drove it after getting the complaints, but at least it’s paved, albeit very roughly. Kitsap County is working with the developer of hundreds of homes to be served by the sewer to get the road restored to its original condition. Jacques Dean of the county public works staff said he’s sent Bayside LLC, the developer that hired C.C. Edwards Construction to install the sewer, a letter demanding a plan for the road repair by May 18. He said the road is at its worst near the bottom of its long downhill run, as braking cars and running rain water take a toll. The company has responded to previous complaints by having the ruts “cold-patched,” meaning unheated asphalt was used. It doesn’t have much durability. Paul Wandling of the city of Bremerton engineering staff, which supervises the sewer installation but not the road repair, said a company official told him the job is on a hiatus of perhaps three-months while the company seeks refinancing. Jacques Dean said the county might attach the bond covering completion of the job if it doesn’t get a satisfactory answer from Bayside.